Essential information is must for any solar mounting projects . it would be a big problem for price quoation. Some times the mis-matched / wrong sizes of mounting kits will be offered of we could not get enough message . It is nice to write to you. This is Jeroen from Netherlands. I would like to buy Solar Panel Mounting Rack for Home Solar. Could you please send me the quotation from this ? What is the lowest price you can offer? Can you please email your EXW prices for solar panel mounting brackets . The enquiries above are not enough , it will cause our engineers have no idea how to proceed . This checklist summarizes the important points, which must be taken into consideration. 2. Where the solar panel will be mounted ? 5. Are there special requirements of wind speed and snow pressure ? __ m/s anit-wind speed and____KN/m2 snow load. – Length of ground screw: mm . Make your solar panel mounting project A success ! 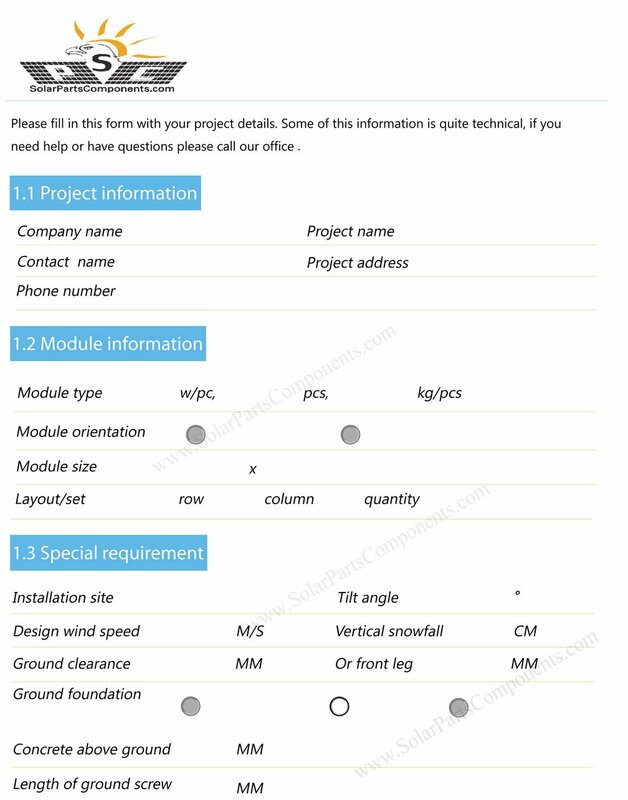 Welcome get more details from www.SolarPartsComponents.com for our solar mounting system evaluations .